In 2012, GACM has successfully established an award for young academics, namely the GACM Best PhD Award. It is our great pleasure to announce that the two outstanding doctoral theses of Dr.-Ing. Johanna Waimann as well as of Dr.-Ing. Dominik Budday are honored with this award for the year 2018. The thesis "Variationelle Modellierung irreversibler Effekte in polykristallinen Formgedächtnislegierungen" of Johanna Waimann was conducted at Ruhr-Universität Bochum and has been performed under the academic supervision of Prof. Klaus Hackl. The thesis of Dominik Budday titled "High-Dimensional Robotics at the Nanoscale – Kino-Geometric Modeling of Proteins and Molecular Mechanisms" was conducted at Friedrich-Alexander-Universität Erlangen-Nürnberg and supervised by Prof. Sigrid Leyendecker. The award will be officially confered at the next GACM Colloquium in Kassel (August 2019). The European Community on Computational Methods in Applied Sciences (ECCOMAS) invites institutions from all over Europe to present proposals for the organization of the 6th Young Investigators Conference (YIC), to be held between April and September, 2021. Further details can be found on http://www.eccomas.org/vpage/1/2/Young-Investigators-Conferences. Institutions interested in organizing YIC 2021 are kindly requested to submit a proposal to the ECCOMAS Secretariat (eccomas@cimne.upc.edu) before May 15, 2019. With great sadness we have to inform you about the passing of Erwin Stein on December 19th 2018. Professor Stein was an international highly renowned authority in Computational Mechanics. He was Honorary President of GACM and his role in forming our scientific society and scientific community was unique. We will always remember him with great respect. Open Call: GACM Best PhD Award 2018 - Application Deadline Extended!!! We are pleased to announce the open call for the "GACM Award for the Best PhD Thesis in Germany 2018"! As in the last years, the GACM Executive Council would like to emphasize the importance of this call for young researchers in Computational Mechanics in Germany. Please, nominate excellent young researchers with their thesis for this award or encourage them to apply. Through an application for the GACM Best PhD Award, a candidate automatically also enters the selection procedure for the upcoming ECCOMAS Best PhD award. Thus, a single nomination/application is sufficient to enter the selection procedure for both awards! Please send the applications (including a copy of the thesis (with date of successful PhD denfense in 2018), a Curriculum Vitae as well as a recommendation letter (one page)) electronically to GACM (gacm@mailbox.tu-dresden.de) before February 1, 2019! On June 11, 2018, during the opening ceremony of the big ECCM-ECFD conference in Glasgow, the former GACM President Professor Ekkehard Ramm received the Euler medal from the European Community on Computational Methods in Applied Sciences (ECCOMAS). According to ECCOMAS, the Euler Medal is awarded for outstanding and sustained contributions to the area of computational solid and structural mechanics. These contributions shall generally be in the form of important research results which significantly advance the understanding of mathematical theories and methods impacting the areas of mechanics. The medal carries the image of Euler (1707-1783). The medal is awarded every two years at the ECCOMAS Congress and Conferences, respectively. A list of all ECCOMAS awardees of this year and pictures from the ceremony can be found here. On June 11, 2018, during the opening ceremony of the big ECCM-ECFD conference in Glasgow, the GACM Member Professor Alexander Popp received the Olgierd Cecil Zienkiewicz Award from the European Community on Computational Methods in Applied Sciences (ECCOMAS). The Zienkiewicz Award is awarded for young scientists outstanding contributions to the field of computational engineering sciences. The medal is awarded every two years at the ECCOMAS Congress and Conferences, respectively. A list of all ECCOMAS awardees of this year and pictures from the ceremony can be found here. It is our great pleasure to announce that Dr. Sylvia Budday (FAU Erlangen-Nürnberg) is not only the recipient of the GACM Best PhD Award 2017, but her thesis "The role of mechanics during brain development" has also been selected as one of two winning dissertations of the ECCOMAS Award for the Best PhD Theses in Europe 2017. The meeting of the Evaluation Committee for the ECCOMAS Best PhD Award was held on April 6th, 2018 at CIMNE, Barcelona. As an answer to the call for tender, the ECCOMAS member associations nominated 17 theses. The Evaluation Committee was composed by Nils-Erik Wiberg (chairman), Stefanie Reese, Wulf Dettmer, Boniface Nkonga and Pedro Díez (secretary). After a detailed discussion, a voting process was held in two phases. Finally, the committee unanimously agreed on selecting the two winners. Dr. Matthias Faes (Belgium) for the thesis "Interval methods for the identification and quantification of inhomogeneous uncertainty in finite element models"
These theses are outstanding works in Computational Mechanics combining excellent knowledge of both theory and practice, with special insight in the fundamental and computational aspects. Both, the two winners are pieces of research that extend the frontiers of the fields of ECCOMAS, and open our community to new problems and methodologies. The award decision was based on the relevance of the topics, the originality of the theses, their scientific content and the innovative numerical developments. Moreover, both theses are very well written and meticulously presented. In 2012, GACM has successfully established an award for young academics, namely the GACM Best PhD Award. It is our great pleasure to announce that the outstanding doctoral theses of Dr.-Ing. Sylvia Budday is honored with this award for the year 2017. Her thesis "The role of mechanics during brain development" was conducted at FAU Erlangen-Nürnberg and has been performed under the academic supervision of Prof. Paul Steinmann. The award will be officially confered at the next GACM Colloquium in Kassel (August 2019). We are pleased to announce the open call for the "GACM Award for the Best PhD Thesis in Germany 2017"! As in the last years, the GACM Executive Council would like to emphasize the importance of this call for young researchers in Computational Mechanics in Germany. Please, nominate excellent young researchers with their thesis for this award or encourage them to apply. Through an application for the GACM Best PhD Award, a candidate automatically also enters the selection procedure for the upcoming ECCOMAS Best PhD award. Thus, a single nomination/application is sufficient to enter the selection procedure for both awards! Please send the applications (including a copy of the thesis as well as a Curriculum Vitae) electronically to GACM (gacm@mailbox.tu-dresden.de) before January 15, 2018! The International Association for Computational Mechanics (IACM) is pleased to announce the Open Call for the IACM Awards 2018, which will be presented at the 13th World Congress on Computational Mechanics (WCCM XIII) in New York, USA, July 22-27, 2018. The Open Call as well as the nomination form are available on the IACM website. The European Community on Computational Methods in Applied Sciences (ECCOMAS) is pleased to announce the new Open Call for the ECCOMAS Award for the Two Best PhD Theses 2016. As in the last years, the GACM Executive Council would like to emphasize the importance of this call for young researchers in Computational Mechanics in Germany. Through an application for the ECCOMAS Award, a candidate automatically also enters the selection procedure for the ECCOMAS PhD Olympiad and the GACM Award for the Best PhD Thesis in Germany, that GACM is awarding since 2012. Please nominate excellent young researchers (e.g. co-workers in your group) with their thesis for this award or encourage them to apply. As you can see from the open call, the nomination/application process is really simple and easy. Please note that applications should be sent to GACM electronically (gacm@lnm.mw.tum.de) before the extended nomination deadline on January 31, 2017. As mentioned above, nominations/applications for the GACM Best PhD Award go hand in hand with nominations for the ECCOMAS Best PhD Award, i.e. a single nomination/application is sufficient to enter the selection procedure for both awards. The 4th International Conference on Computational Engineering will take place from Thursday, September 28, to Friday, September 29, 2017 at the darmstadtium conference center next to Technische Universität Darmstadt. The conference is organized by the Graduate School of Computational Engineering (GSC CE) at TU Darmstadt together with the International Graduate School of Science and Engineering (IGSSE) at Technical University of Munich, the Stuttgart Research Center for Simulation Technology (SimTech) at University of Stuttgart and the Aachen Institute for Advanced Study in Computational Engineering Science (AICES) at RWTH Aachen University. The conference provides a meeting place for researchers and practitioners working on computational methods in all disciplines of engineering and applied mathematics, with a special focus on doctoral researchers and young scientists. The aim of the conference is to discuss the state of the art in this challenging field, develop promising perspectives for future research and initiate cooperations. It is with greatest sadness that we have to inform the GACM community of the much too early passing of Prof. Christian Miehe. The whole GACM is grieving for one of the international leader in our field, a long time member of GACM and a personal and close friend to many of us. We have asked some of his closest colleagues and friends for some words on this tragic loss. With deep regret and great sadness we learned that Professor Christian Miehe passed away after a serious illness on 14 August 2016 at the age of 60. For more than 20 years he held the chair for Applied Mechanics and Material Theory at the Department of Civil and Environmental Engineering of the University of Stuttgart. He was also the chairman of the master program “Computational Mechanics of Materials and Structures (COMMAS)”; he has substantially contributed to its great success. Christian Miehe was a worldwide leading figure in computational mechanics. His exceptional scientific achievements in solid mechanics and in particular in modeling of heterogeneous materials were characterized by an amazing breadth and impressive depth. He established general concepts for the analysis of material behavior representing the complex microstructure and its evolution on several scales, also in multi-physics environments. They include advanced homogenization and multi-scale techniques with many novel features, using for example mathematically rigorous minimization principles. His recent works on phase field models were milestones opening a new door for modeling solids at fracture. Christian was also a dedicated educator and highly esteemed mentor to his PhD students. A strong indication for the quality of his supervision are the many excellent, frequently cited papers in high rank journals. He was a regular participant and often invited plenary speaker on international conferences, among them ECCOMAS Congresses, ECCM and Thematic Conferences, e.g. COMPLAS. Most of all, Christian was a great personality and for many of us a wonderful friend. His passing is truly a great loss to the world of computational mechanics and leaves a vacuum in our community. It is with great sadness that we inform you of the early passing of Christian Miehe after a valiant battle with cancer. Christian was an internationally renowned expert in computational mechanics. He began his career in the well-known mechanics program at the University of Hannover, receiving his Diploma, PhD, and Habilitation there. In between, he spent two very fruitful years at Stanford University as a research fellow of the German Science Foundation (DFG). In 1995 he was called to the Department of Civil and Environmental Engineering at the University of Stuttgart to lead the chair for Mechanics and Material Theory at the Institute of Applied Mechanics, where he was also active as one of its directors. Over the past two decades in Stuttgart, he led one of the most successful and respected groups in material modeling and numerical methods. This included deep involvement in the creation of the well-respected COMMAS (Computational Mechanics of Materials and Structures) masters program. optimization methods, parameter identification of complex material models, and experimental mechanics. Christian devoted an impressive intensity and infectious love for these topics that can be evidenced by the accomplishments of his many students. Christian was the personification of the perfect scholar and a beloved mentor to young scholars, a person who devoted his life and personality to advance and promote computational mechanics and material theory: A great loss for the international community. Christian was also internationally active and well known for being the consummate host. He organized conferences and workshops and was a distinct member serving on several editorial boards and organizations. Conferences and workshops hosted by him were well attended by guests who departed with nothing but fond memories. Visitors to the Institute cherished their time there and he was always a sought-out friend at meetings around the world. Christian was a fine downhill skier, lover of sweet desserts, and special person to be around. His early death leaves a deep void in the hearts of many, but most tragically for his wife and life partner Elke and their two sons Robert and Paul. As every year, the Deutsche Forschungsgemeinschaft (DFG) awards the Heinz Maier Leibnitz Award for young investigators. Excellent young researchers working in the fields of interest of GACM are strongly encouraged to apply. As a first step, only the CV and a list of publications shall be sent to the responsible DFG review board members Prof. Günther Meschke, Prof. Manfred Bischoff and Prof. Wolfgang Ehlers (deadline: August 20, 2016) . After this first stage, three promising candidates will be selected and the complete application material must be uploaded to the DFG ELAN web-portal (deadline: August 27, 2016). At the 7th European Congress on Computational Methods in Applied Sciences and Engineeering (ECCOMAS Congress 2016) in Crete, GACM Secretary General Dr. Alexander Popp (TU Munich) was elected as new chairman of the ECCOMAS Young Investigators Committee (EYIC). Together with another GACM member, Dr. Stefanie Elgeti (RWTH Aachen) as co-chairperson, he will lead the committee that has been created in order to promote the main goals of ECCOMAS among young researchers and to encourage activities of young ECCOMAS members. With the number of young investigators working on computational methods in applied sciences and engineering significantly increasing over the last years, the EYIC has become a very important and dedicated coalition of young researchers across Europe. The EYIC is composed of currently 21 members representing the different national and regional associations within ECCOMAS and has a term of four years. On June 6, 2016, during the opening ceremony of the big ECCOMAS congress in Crete, GACM President Professor Wolfgang A. Wall received the Prandtl medal from the European Community on Computational Methods in Applied Sciences (ECCOMAS). According to ECCOMAS, the Prandtl Medal is awarded for outstanding and sustained contributions to the area of computational fluid dynamics. These contributions shall generally be in the form of important research results which significantly advance the understanding of theories and methods impacting CFD. The medal carries the image of Ludwig Prandtl (1875-1953). The medal is awarded every two years at the ECCOMAS Congress and Conferences, respectively. A list of all ECCOMAS awardees of this year can be found here. 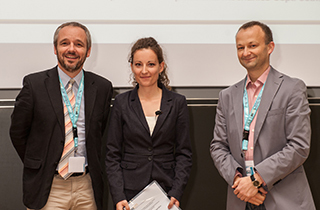 It is our great pleasure to announce that Dr. Ursula Rasthofer (doctorate at TU München, now ETH Zürich) is not only one of the two recipients of the GACM Best PhD Award 2015, but her thesis "Computational Multiscale Methods for Turbulent Single and Two-Phase Flows" has also been selected as one of two winning dissertations of the ECCOMAS Award for the Best PhD Theses in Europe 2015. The meeting of the Evaluation Committee for the ECCOMAS Best PhD Award was held on April 1st, 2016 at CIMNE, Barcelona. As an answer to the call for tender, the ECCOMAS member associations nominated 17 theses. The Evaluation Committee was composed by Nils-Erik Wiberg (chairman), Claudia Comi, Harald Van Brummelen, Stefan Vandewalle and Pedro Díez (secretary). After a detailed discussion, a voting process was held in two phases. Finally, the committee unanimously agreed on selecting the two winners. Dr. Ursula Rasthofer (Germany) for the thesis "Computational Multiscale Methods for Turbulent Single and Two-Phase Flows"
Dr. Frederico Negri (Switzerland) for the thesis "Efficient Reduction Techniques for the Simulation and Optimization of Parameterized Systems: Analysis and Applications"
These theses are outstanding works in Computational Mechanics combining excellent knowledge of both theory and practice, with special insight in the implementation and computational aspects. The award decision was based on the originality of the theses, their scientific content and the innovative numerical developments. In 2012, GACM has successfully established an award for young academics, namely the GACM Best PhD Award. It is our great pleasure to announce that not only one but two outstanding doctoral theses will be honored with this award for the year 2015. The awardees are Dr.-Ing. Ursula Rasthofer for her thesis "Computational Multiscale Methods for Turbulent Single and Two-Phase Flows" and Dr-Ing. Richard Ostwald for his thesis "Modelling and Simulation of Phase-Transformations in Elasto-Plastic Polycrystals". The PhD work of Dr. Rasthofer led to a doctoral degree from TU München and has been performed under the academic supervision of Dr. Volker Gravemeier. Dr. Ostwald conducted his PhD work at TU Dortmund under the academic supervision of Prof. Andreas Menzel. The two awards will be officially confered at the next GACM Colloquium in Stuttgart (October 2017). We would like to draw your attention to the 5th European Trilinos User Group Meeting (EuroTUG2016) that will take place April 18-20, 2016 in Garching near Munich at the Leibniz Rechenzentrum (LRZ) and is jointly hosted by LRZ and TU Munich this year. EuroTUG is an annual meeting that brings together researchers, developers and users of the open source scientific software collection ’Trilinos’ from Sandia National Laboratories, USA. The meeting is designed as a platform for discussions and information on latest trends in HPC scientific software, massively parallel computing, efficient algorithms and HPC enabling technologies, with a special emphasis on usage of the Trilinos software suit in this context. EuroTUG will supply an overview of the Trilinos software suit as well as beginners and advanced tutorials. One of this year’s focuses is on usage of Trilinos-Kokkos, a programming model for performance portable applications targeting all major platforms including Nvidia, Xeon Phi and manycore complex hardware node architectures. Registration information and all details can be found at the meeting website. There are still slots for contributed presentations, so if you are interested in presenting your Trilinos-related work, please indicate so in the registration process or email to eurotug2016@mhpc.mw.tum.de. As part of the 2016 Alexandre Favre Session, a CISM Advanced Course on Computational Contact and Interface Mechanics will take place October 3, 2016 - October 7, 2016 in Udine, Italy. The summer school is organized by the two GACM members Alexander Popp (Technical University of Munich) and Peter Wriggers (Leibniz University of Hannover) and a flyer with detailed information is available here. For more information on this course, please see http://www.cism.it/courses/C1612/. For further CISM courses in 2016, see http://www.cism.it/courses. ECCOMAS is happy to announce this summer school - fruit of the cooperation between ECCOMAS and the International Centre for Mechanical Sciences (CISM) - which will take place June 27, 2016 - July 1, 2016 in Udine, Italy. The summer school flyer with detailed information is available here. For more information on this course, please see http://www.cism.it/courses/C1606/. For further CISM courses in 2016, see http://www.cism.it/courses. The USACM Thematic Conference on Isogeometric Analysis and Meshfree Methods (IGA-Meshfree 2016) will be held in La Jolla, California, October 10-12, 2016 at the Estanica La Jolla Hotel and Spa. Abstract submissions is now open. For more information about this event, please visit the conference website at http://iga-mf.usacm.org/. The European Community on Computational Methods in Applied Sciences (ECCOMAS) is pleased to announce the Open Call for the ECCOMAS Award for the Two Best PhD Theses 2015. As in the lasts year, the GACM Executive Council would like to emphasize the importance of this call for young researchers in Computational Mechanics in Germany. Through an application for the ECCOMAS Award, a candidate automatically also enters the selection procedure for the ECCOMAS PhD Olympiad and the GACM Award for the Best PhD Thesis in Germany. Please note that GACM has decided to extend the official nomination deadline to February 13, 2016. The Young Investigators Committee (YIC) of ECCOMAS is proud to announce the Young Investigators Minisymposium that will take place within the ECCCOMAS Congress 2016 in Crete / Greece on June 5-10, 2016. This minisymposium is specifically organized by young researchers (all of which are members of the ECCOMAS Young Investigators Committee) for young researchers, and the format will be slightly different from the regular sessions to particularly attract young researchers. While the primary focus group are researchers younger than 40 years, of course we also warmly welcome senior scientists. All details on the proposed format and on the prerequisites for participating can be found in the invitation letter (click here or on the image). Especially important is the following: since the format of this minisymposium is different from the regular ones, authors are allowed to have a presentation in this minisymposium in addition to a regular one in any other session. The deadline for abstract submission is November 29, 2015! We would like to address your attention to the Special Workshop on Multiscale Modeling of Heterogeneous Structures, which will take place in Dubrovnik / Croatia on September 21-23, 2016. In particular, young researchers are encouraged to present results of their scientific work. Presentations of work in progress are also welcome. Feel free to inform your research partners about this special event organized by O. Allix (ENS Cachan), J. Soric (University of Zagreb) and P. Wriggers (Leibniz Universität Hannover). Please have a look at the workshop flyer (right) for further information. The GACM Colloquium on Computational Mechanics and ECCOMAS Young Investigators Conference YIC GACM 2015 held in Aachen during July 20-24, 2015, has been a resounding success. More than 280 young scientists under the age of 35 from Europe and other parts of the world took part in minisymposia, parallel sessions, and attended plenary lectures, including those offered as a part of the concurrently held 3rd Aachen Conference on Computational Engineering Science. Innovative elements, such as Science Slam and the Journal Club, were a popular part of the program. The conference was chaired by Dr. Stefanie Elgeti (Chair for Computational Analysis of Technical Systems - CATS) and by Dr. Jaan-Willem Simon (Institute of Applied Mechanics - IFAM), supported by a local organizing committee. The ECCOMAS YIC Conference is an initiative of the ECCOMAS Young Investigators Committee. Alongside the scientific program, the conference included a talk "Science of the Big Bang" by Dr. Mayim Bialik, better known as Amy Farrah Fowler on the hit TV series The Big Bang Theory. Next to her career as an actress and a neuroscientist, Ms. Bialik is an advocate for encouraging high school students to enter STEM-related fields. The visit, her first to Germany, was negotiated by the conference co-chair Dr. Elgeti, and generated national coverage by the Hamburger Abendblatt, Berliner Tagesspiegel, Kölner Express, Kölner Stadtanzeiger, and even Bild. The news item on the RWTH Aachen University Facebook page received over 20 thousand "likes" and more than thousand comments in just 24 hours. Just in time for the 6th GACM Colloquium on Computational Mechanics (which is held in conjunction with the 3rd ECCOMAS Young Investigators Conference at RWTH Aachen University on July 20-23, 2015), GACM is very happy to present the new issue of our regular news bulletin GACM Report. The current issue No. 9 has been edited by our executive council member Thomas Münz (Dynamore GmbH) and focuses on industrial applications of computational mechanics. On the occasion of the re-launch of the GACM website, we have decided to make also the current issue No. 9 publicly available, while all other issues can accessed and downloaded by logging in to the Members Area. The European Community on Computational Methods in Applied Sciences (ECCOMAS) has recently published its new online newsletter. GACM, being one of the member organizations of ECCOMAS, is happy to offer this interesting reading to its members. The European Community on Computational Methods in Applied Sciences (ECCOMAS) is pleased to announce the Open Call for the ECCOMAS Award for the Two Best PhD Theses 2014. As last year, the GACM Executive Council would like to emphasize the importance of this call for young researchers in Computational Mechanics in Germany. Through an application for the ECCOMAS Award, a candidate automatically also enter the selection procedure for the ECCOMAS PhD Olympiad and the GACM Award for the Best PhD Thesis in Germany. The deadline for nominations is February 16, 2015. We are pleased to announce the 10th International Workshop on Variational Multiscale and Stabilized Finite Elements (VMS2015) to be held on February 25-27, 2015 at the Institute for Computational Mechanics, TUM in Garching / Germany. The international workshop series on Variational Multiscale and Stabilized Finite Elements (VMS) was initiated in Göttingen in 2004 for gathering researchers in the field of variational multiscale and stabilized finite element methods to exchange their most recent ideas and research results. Originally developed in the context of flow problems, these computational methods have shown their potential for being successfully applied to a broad variety of problems. The objective of VMS2015 is to be again a forum where the participants are invited to present their latest results in this field of research. Both novel theoretical developments and applications in this context are encouraged to be presented at VMS2015. 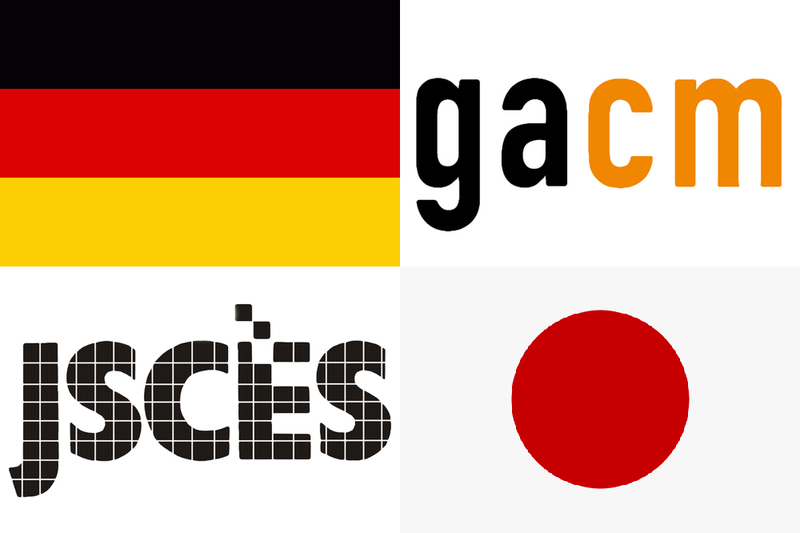 The German Association for Computational Mechanics (GACM) and the Japan Society for Computational Engineering and Science (JSCES) are happy to announce that the 3rd German-Japanese Workshop on Computational Mechanics will take place in Munich, Germany on March 30-31, 2015. The aim of this workshop series is to intensify the scientific relationship between senior and junior German and Japanese researchers in the broad field of computational mechanics. The first two workshops in this series took place in Yokohama, Japan, and Hannover, Germany. 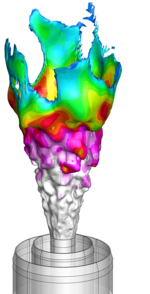 we are pleased to announce the 2nd International Workshop on Latest Advances in Cardiac Modeling to be held in Munich on March 12-13, 2015 at the German Heart Center Munich. For organizational purposes it would be great to hear back from you at your earliest convenience. So, if you are intending to submit an abstract or to just attend the workshop without a talk, we would appreciate you give us a short notice. It is our great pleasure to announce that the 4th International Conference on Computational Contact Mechanics (ICCCM15) will be organized by the Institute of Continuum Mechanics together with the MUSIC Graduate School (Multiscale Methods for Interface Coupling) at Leibniz Universität Hannover under the auspices of ECCOMAS and GACM. The conference will be held from May 27-29, 2015 at the Leibniz Universität Hannover, Germany. As a conference designed by young researchers for young researchers, we will offer a variety of highlights such as a Science Slam, a Journal Club, and numerous social events. In addition, we will host the ECCOMAS Ph.D. Olympiad of 2015. We are very happy to announce that the event will be held in direct sequence with the AC.CES conference organized by the graduate school AICES of RWTH Aachen University. The target group of the YIC GACM 2015 is young researchers under the age of 35. Of course, senior scientists are welcome as well. It is with great sadness that we have to report to the GACM membership that Ted Belytschko, one of the most influential, creative and dominating scientists in Computational Mechanics in the last decades and a good friend to many of us, passed away on September 15 at the age of 71. Ted Belytschko was born on January 13, 1943. He has earned his bachelor’s degree in mechanics and his Ph.D. in engineering sciences at the Illinois Institute of Technology. 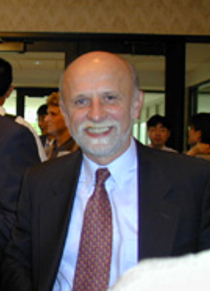 He joined the faculty at Northwestern University in 1977 and had been a professor of computational mechanics since 1991; since 2003 he was not only the Walter P. Murphy Professor but also had been a McCormick Distinguished Professor. This is not the place to list all the great, innovative and sustained contributions that Ted has made in our field. Science and the development of computational methods for engineering problems and the applied sciences was not only his profession but his passion. He has been working on an amazing wide variety of topics in an impressive depth. He has published great and widely used books and more than 400 journal papers. Besides his research and teaching activities, Ted was also very committed in our scientific community and has provided outstanding service in many ways over the years. And he has received numerous distinguished honors and awards including a number of the most prestigious medals in the field. But the most significant honors and awards are probably the many successful careers of his former Ph.D. students and coworkers and the honest and highest reputation - as a teacher, a scientist, a mentor and as a person and friend - that he has enjoyed from many colleagues and people in the field. Ted also had a special relationship to Germany. When he was a kid he lived here with his parents for a while and he could speak German very well - several times proven, starting with a charming "Wie geht es Ihnen?". Already in the 1970s he took part in a US-German Symposium and in numerous more meetings in Germany since then. Several GACM members also had the privilege to work with him as a postdoc in his lab at Northwestern University. GACM cordially bows to this great man, scientist and friend and we all will keep his memory in great honor. It is our great pleasure to announce that Dr. Henning Sauerland (RWTH Aachen) is not only the recipient of the GACM Best PhD Award 2013, but his thesis "An XFEM based sharp interface approach for two-phase and free-surface flows" has also been selected as one of two winning dissertations of the ECCOMAS Award for the Best PhD Theses in Europe 2013. The meeting of the Evaluation Committee for the ECCOMAS Best PhD Award 2013 was held on May 9th, 2014 at CIMNE, Barcelona. As a response to the call for tender, the ECCOMAS Member Associations nominated 16 theses. The Evaluation Committee was composed by Nils-Erik Wiberg (chairman), Marino Arroyo, Chris Lacor, Simona Perotto, and Josef Eberhardsteiner (secretary). After a detailed discussion, a voting process was held in two phases. Finally, the committee unanimously agreed on selecting the two winners. Dr. Henning Sauerland (Germany) for the thesis "An XFEM based sharp interface approach for two-phase and fr!ee-surface flows"
Dr. Francesc Verdugo (Spain) for the thesis "Error assessment and adaptivity for structural transient dynamics"
Both theses are outstanding works in Computational Methods combining excellent knowledge of both theory and practice. The award decision was based on the originality of the theses, its scientific contents and the innovative numerical developments. At the last general assembly of GACM the member body of GACM voted with one accord for a proposition brought in by the president and the executive council to not install awards for senior researchers but to establish an award for young academics, namely the GACM Best PhD Award. The first such award was confered at the GACM colloquium 2013 in Hamburg and the awardee is Dr.-Ing. Bojana Rosic for her thesis "Variational Formulations and Functional Approximation Algorithms in Stochastic Plasticity of Materials". The PhD work of Dr. Rosic led to a joint doctoral degree from TU Braunschweig and the University of Kragujevac and has been performed under the academic supervision of Prof. Herrmann Matthies and Prof. Miroslav Zivkovic. As awardee Dr. Rosic was also invited to give a plenary lecture at the GACM colloquium 2013 and all colloquium partcipants could witness an impressive presentation. 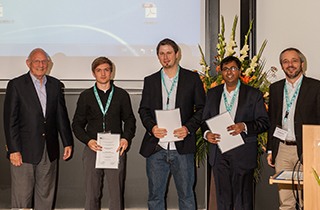 During the GACM colloquium 2013 in Hamburg, again a poster competition took place. The jury consisting of the plenary lecturer of the colloquium, the conference chairman and the GACM president had a hard time to choose from a number of outstanding posters. Finally the decision was to confer three awards. The first prize went to Florian Hindenlang from the University of Stuttgart for his excellent poster contribution “Discontinuous Galerkin for High Performance Computational Fluid Dynamics“. The second prize went to Severin Schmitt from the Karlsruhe Institute of Technology for his excellent poster contribution “Towards a Dislocation based Continuum Theory of Plasticity“ and the third prize to Ajay B. Harish from the Leibniz University Hannover for his excellent poster contribution “Computational Implementation of Finite Thickness Non-Local Cohesive Zone Element for Crack Propagation in Filled Elastomers“.